Saint Jerome, who's memorial we celebrate today, is perhaps best known for his translation of the Bible into Latin (the Vulgate) and for his celebrated line, "Ignorance of the Scriptures is ignorance of Christ." "Man's nature is such that truth tastes bitter and pleasant vices are esteemed" (Letter XL). "Indeed it is dangerous to pass sentence on another's servant, and to speak evil of the upright is a thing not lightly to be excused" (Letter XLV). "I often discoursed on the Scriptures to the best of my ability: study brought about familiarity, familiarity friendship, friendship confidence" (Letter XLV). "...people are more ready to belive a tale which, though false, they hear with pleasure, and urge others to invent it if they have not done so already" (Letter XLV). "Our opinion of you is like your opinion of us, and each in turn things the other insane" (Letter XLV). "Let them know us [clergy] as comforters in their sorrows rather than as guests in their days of prosperity" (Letter LII). "Change your love of necklaces and jewels and silk dresses to a desire for scriptural knowledge" (Letter LIV). "The face is the mirror of the mind, and eyes without speaking confess the secrets of the heart" (Letter LIV). "I groaned to hear his tale, and by silence expressed far more than I could with words" (Letter CXVII). "...even if your own conscience is unhurt, scandal brings disgrace" (Letter CXVII). "Marriage is a raft for the shipwrecked, a remedy that may at least cure a bad beginning" (Letter CXVII). "Nothing is happier than the Christian, for to him is promised the kingdom of heaven: nothing is more toil-worn, for every day he goes in danger of his life. Nothing is stronger than he is, for he triumphs over the devil: nothing is weaker, for he is conquered by the flesh" (Letter CXXV). "If the merchants of this world undergo such pains to arrive at doubtful and passing riches, and after seeking them in the midst of dangers keep them at the risk of their lives, what should not Christ's merchant do who sells all he has to buy the pearl of great price, and with his whole substance buys a field that he may find therein a treasure which neither thief can dig up nor robber carry away" (Letter CXXV)? There is a particular passage for which I am looking. If I find it, I will post if for you later tonight. I was heading back to my study hall, after going to put some homework away, when I decided I’d see if Fr. Daren was around to just hang out and talk with him. A few steps later I stopped, realizing that Fr. Daren was gone. No more random hellos in the hallway, no more chess club games, no more soccer practice with him as assistant coach! It might not have happened to you yet, but you’ll probably “realize” that Papa D has left sometime soon, like when you see someone drinking a can of Dr. Pepper, go to eat at Buffalo Wild Wings, or when you go to church. No one wanted to give him up, but he had to go. Even though he’s gone, the time he spent with us was the greatest! He was a great priest, and an even better friend. If you’re ever feeling the “Papa D blues”, there’s always texting, phone calls, Facebook, and Virden is only 2 hours away if you have time to visit. We know he’ll do well in Virden, and hopefully he’ll come back to visit Effingham very often! Keep him in your prayers and send him a text to say good luck! I don't know what to say. I do miss those kids. I suppose that's a fourth gift the Lord sent my way today. Those insightful Dominicans have an excellent post on one of my favorite virtues: eutrapelia. It's one of the reasons I still sneak away for soccer games, as I hope to do again tomorrow, and maybe even on Thursday, too. If you haven't read Hugo Rahner's book Man at Play: Or Did You Ever Practice Eutrapelia, now's a good time to do so. This evening I had the pleasure of convoking again the former Parish Finance Council. After requesting their continued service - and receiving affirmative responses - I will be happy to reappoint each of the members (in the morning). I mention this because the Lord has sent two great gifts my way today. The first came in the morning of an envelope from the Office of the Master of the Liturgical Celebrations of the Supreme Pontiff. In it was my ticket to help with the distribution of Holy Communion during the Mass of canonization of Blessed Damien of Molokai. Strange as it may seem, the meeting of the finance council is the second of these two great gifts. It is a group of people whose wisdom and guidance I will seek readily and they have - in only meeting - demonstrated the effectiveness. They are eager to help and have offered what is - in my judgment - very good counsel. And now I will close the day with third good gift: a bowl of fresh pineapple. When I was in Effingham one of the friars gave me a holy card that I recently rediscovered. The seventh child in a family of twelve children, Lawrence Van Ackeren was born at Humphrey, Nebraska, on February 17, 1918. Even as a boy he stood out by reason of his spirit of prayer and his love of our Lord in the Blessed Sacrament. After completing the grade school, he wanted to go to the Franciscan preparatory seminary at Oak Brook, Illinois; but he had such a hard time with his studies that he was told to finish high school first. In September, 1936, he was admitted to the preparatory seminary and joined the fourth-year students. But by Christmas he realized that he did not have sufficient talent to pursue the required studies for the priesthood, and he applied for admission as a Franciscan lay brother. Toward the end of January, 1937, he was sent to St. Joseph Theological Seminary, Teutopolis, Illinois, and was invested as a Third Order Brother about a month later, receiving the name of Brother Simon. His ankle started to bother him about a year after he arrived at Teutopolis, and he began to walk with a slight limp. Soon afterwards, the limb became too painful and he could scarcely walk. He was taken to St. Anthony Hospital in nearby Effingham and received treatments for a month, but his ankle failed to respond. He returned to the seminary on crutches, and was permitted to make his profession as a Third Order brother on March 4, 1938. The next day he left for St. Louis to consult a specialist. After three weeks he came back, his ankle in a cast. The verdict was tuberculosis of the bone. Soon his general health began to fail. On the last day of April he went to the hospital in Effingham. There the doctors found that he had galloping consumption and gave him only a short time to live. Brother Simon's condition quickly grew worse, and he was anointed on the sixth day after his arrival at the hospital. The next few days his strength failed rapidly. About ten o'clock on the night of May 10, while the sister on night duty was with him, his innocent soul winged its way to heaven. Though he was only a Third Order brother for little more than a year, Brother Simon has gained a greater reputation as a saint and intercessor in heaven than any other deceased member of the Franciscan Province of the Sacred Heart. During his illness and suffering no one heard an impatient word escape his lips; and he never ceased praying. His sunny smile never wore off. His greatness consisted in doing the little things well - doing them with extraordinary and always cheerful willingness, fidelity, charity, patience, and piety. "Being made perfect in a short space, he fulfilled a long time" (Wisdom 4, 13). As it was Brother Simon's delight to help others in life, so he has continued to help others in a remarkable manner also after his death. Innumerable favors have been reported and attributed to his intercession. Strangely enough Brother Simon is gaining a growing reputation as a missionaries' broker and a helper in financial difficulties. Favors are reported also from sick persons who have gained health or alleviation from ill health through a novena made in his honor. If you have a special prayer request, why not ask Brother Simon for the help of his prayers? I will ask his assistance this morning for a student concerned about taking his religion test today. O Lord, in these days wherein souls are hungering for pleasure and devoured by greed, and refuse to renounce themselves to take up your Cross and follow you, you have raised in our midst Brother Simon, who during his short life kept his eyes on your passion and, responding to your call, gave himself to you. Touched with this excess of charity and spirit of renunciation in a world of ingratitude, you have deigned, O Lord, apparently as a sign of approval, to make him a champion of your Cross. We beseech you, O Lord, to make known the power of intercession reserved to your servant by hearing the prayers we are saying in union with his, and to grant us not only the petition of this novena, but also the grace to follow you, who are the Way, the Truth, and the Life. Amen. After this prayer, you are to pray five Our Fathers, five Hail Marys, and five Glory Bes, in honor of the Five Holy Wounds. Answers to petitions made through Brother Simon's intercession should be addressed to Ms. Mary Jo Van Ackeren, 145 S. Rose Lane, Columbus, Nebraska 68601. O, Jesus, you love the meek and humble of heart. Hear the prayers we offer you in honor of your humble servant, Brother Simon. Approve the cause of his beatification. Through his merits and intercession may we receive the favors we seek. We ask this in your name, Christ our Lord. Amen. I know this beloved carol has precious little to do the actual life of the good King Wenceslaus, but still I like it. And the pictures are fun. Enjoy! I woke this morning right about three o'clock to some buzzing or ringing sound that I could not immediately determine. I thought it might be the telephone in the bed room I am in (which apparently wasn't plugged in until about seven o'clock yesterday evening). That was not it. Then I thought it might be a smoke alarm somewhere in the house. That was not it, either. When I returned upstairs the I could tell the sound was coming only from the area of my bed room, by the door and, after some pondering and checking of electronic things, inside the wall. It is a pparently a cricket that is afraid neither of pounding on the wall nor of the television. I am at a loss at to what to do. It is so loud that if I moved to a guest room I would still hear the cricket loud and clear. Now I know why Saint Francis of Assisi told the cricket to stop singing. I tried; it is not listening to my request. I guess, at least, I do not have a spider wandering around me as I address a gathering, like the Holy Father had recently (capello tip to Carl Olson). Are there any simple cricket removal methods? ...and others who are in the know: I need your advice. Looking around the rectory I have realized that I am drastic need of a new mop and broom, or swiffer wet or dry, or some other such item to be utilized in the cleaning of the kitchen and bathroom floors. What do you most recommend? I'd like something simply but that also does a good and thorough job. If that means a regular mop and bucket, so be it. The Diocese of Springfield in Illinois was created in 1853 from the territory of the former Diocese of Alton, which was formerly the Diocese of Quincy. The See City was transfered with the changing modes of transportation; the coming of the railroad made Springfield a city easy to reach without relying on the mighty Mississippi River, on whose banks sit the cities of Quincy and Alton. All of this is a set up for the news of a truly profound moment in the life of the Church of Springfield in Illinois to take place tomorrow in the former Cathedral of the Diocese of Alton, the church of Saints Peter and Paul, when Steven Thompson will ordained to the Order of Deacons at the hands of His Excellency, the Most Reverend Victor Balke, Bishop of Crookston and a son of the Diocese. I ask your prayers for Steven and for the Diocese as Bishop Balke ordains him for service in the Church, with the view of Steven's ordination to the Priesthood of Jesus Christ. I know Steven to be a good man of prayer and look forward to ministering with him in the years ahead. His quality was reaffirmed for me at the recent clergy convocation when he and spent one of the sessions in an excellent conversation. He will be a good and holy deacon and priest, with the help of your prayers. I regret that I will be unable to be present for his ordination; I will have to preside at a burial here in Virden at the time of his ordination. Is it really Friday already? I've no idea how that happened! I cannot say that the past few days have been busy per se, but they have been full. I have spent them largely cleaning our drawers and closets in the house, sorting through various papers to see what is important and what is not, learning about the parish finances and unpacking (which seems to be least on the list). I have met several very friendly and helpful parishioners this week who have very generously offered to help me in whatever way they can. I would like to take them up on their offers, but am not quite sure what to have them do. I am delighted to have a Deacon who lives in the parish but is assigned to another parish north of here. He attends daily Mass here since he works in town and has been a great help to me; it's also very nice to have a deacon at daily Mass. He has served on the finance council in the past and helped me considerably Monday morning but running through various financial matters. I am happy to say that I have a very capable and efficient secretary. She is new to the post so we are learning together. In many ways this is a blessing since we can organize the office together so both of us know where we put things. She works part-time as things in the parish are rather quiet. We have only 169 families here in Virden and only 127 families in Girard. The combined number of actual parishioners - at least according to the books - is 669. Wednesday morning the current and former secretaries and I sat down for a couple of hours to go through several things in the parish, from files to finances. I felt much more comfortable after our meeting. We also have a very faithful, dedicated and thorough sacristan at the parish who sets up for the Masses and various liturgical celebrations. He has worked as the sacristan for many years and knows just about all there is to know. Tuesday morning he took me on a lengthy tour of the parish complex and told me more information than I could retain. I will have to ask him several questions later on. Several years ago the parish between a period of twenty-four hours of Eucharistic Adoration following Mass on Wednesdays. I could not be more pleased to have this in the parish, especially considering our smaller size. I am confident that it will bring many rich blessings from the Lord. I have also made it back to Effingham this week for two soccer games, both of which, I am happy to say, the boys won. When I went to the game yesterday I also stopped in for a haircut. The woman I go to does a great job and I am not sure I want to try another person. A good haircut is not always easy to find. Life in Virden has certainly been an adjustment. The city has - according to the population sign when you enter town (which seems a bit high) - 3,500 citizens. The bank closes daily at 3:00 p.m. (which caught me quite by surprise Wednesday afternoon when I went to have my name put on the parish accounts). There is no grocery store (though I hear one is being planned). I am not sure if we have a dry cleaners yet. We do not have a McDonald's (which does not bother me much), but we do have a Dairy Queen and a Star Hardee's. In terms of shopping, we have a Family Dollar (or a Dollar General, I do not remember which). Springfield is just twenty-five minutes north and that drive somehow does not now seem very long. Being from Quincy, where anything more a seven minute drive is long, this feels very strange to say, but it is true. I suppose I have adapted well to my new surroundings. Virden is a quiet town and peaceful and I do not believe it has a stop light. Less than ten percent of the population has a bachelor's degree and fewer than three percent have advanced degrees. Here in Virden we are 150% more likely to have a tornado than the rest of the country, but we are 97% less likely to experience an earthquake than the rest of the country. Today I intend to finish settling into my office (I finally found my printer cable last night) and then work on the kitchen. Sometime today I will have to go to Springfield to pick up several supplies for the secretary and I also have to shop for groceries sometime. 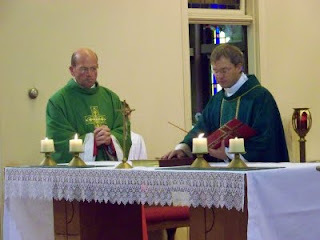 During the celebration of the Holy Mass, the Reverend Monsignor Carl A. Kemme, Administrator of the Diocese of Springfield in Illinois and a good friend, publicly installed me as Pastor of Sacred Heart parish in Virden and of St. Patrick parish in Girard. Many positive comments have been received on the simply but profound ceremony. I am deeply grateful for Msgr. Kemme's support, encouragement and prayers. His presence yesterday was a great help to me and to the parishioners. and the signing of the Oath itself. More pictures can viewed can be viewed on my Facebook page. Today has been a good, productive and informative day. After Mass I cleaned the sacristy a bit. After unpacking a bit more in the house, I met with a parishioner and member of the finance council to talk through the parish finances. That meeting was very good and helpful. Soon I'll convoke the pastoral council and set to work on what needs to be done, both temporal and spiritual. On Sunday Sacred Heart parish in Virden and St. Patrick parish in Girard will welcome the Diocesan Administrator, the Reverend Monsignor Carl A. Kemme, a native of Shumway. Although I took canonical possession of my parishes this past September 15th, the memorial of Our Lady of Sorrows, he will install me as Pastor in a public way. I believe in one god, the Father, the Almighty, maker of heaven and earth, of all that is seen and unseen. I believe in one Lord, Jesus Christ, the only Son of god, eternally begotten of the Father, God from God, Light from Light, true God from true God, begotten not made, one in Being with the Father. Through him all things were made. For us men and for our salvation he came down from heaven: by the power of the Holy Spirit, he was born of the Virgin Mary, and became man. For our sake he was crucified under Pontius Pilate; he suffered, died and was buried. On the third day he rose again in fulfillment of the Scriptures; he ascended into heaven and is seated at the right hand of the Father. He will come again in glory to judge the living and the dead, and his kingdom will have no end. I believe in the Holy Spirit, the Lord, the giver of life, who proceeds from the Father and the Son. With the Father and the Son he is worshipped and glorified. He has spoken through the prophets. 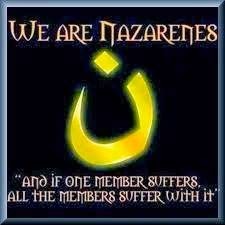 I believe in one, holy, catholic and apostolic Church. I acknowledge one baptism for the forgiveness of sins. I look for the resurrection of the dead, and the life of the world to come. Amen. With firm faith I believe as well everything contained in God's word, written or handed down in tradition and proposed by the Church - whether in solemn judgment or in the ordinary and universal magisterium - as divinely revealed and calling for faith. I also firmly accept and hold each and every thing that is proposed by that same Church definitely with regard to teaching concerning faith or morals. What is more, I adhere with religious submission of will and intellect to the teachings which either the Roman Pontiff or the college of bishops enunicate when they exercise the authentic magisterium even if they proclaim those teachings in an act that is not definitive. I will proclaim the Gospel and Monsignor Kemme will preach, explaining the office of a pastor and the meaning of the rites. My dear brother, in the presence of the people whom you are about to receive into your care, I ask you to renew the promises you made at your ordination. Are you resolved that under the guidance of the Holy Spirit you will without fail live up to your responsibility to be the faithful co-worker of the order of bishops in shepherding the flock of the Lord? Are you resolved that in praise of God and for the sanctification of the Christian people you will celebrate the mysteries of Christ devoutly and faithfully, and in accord with the tradition of the Church? Are you resolved that in preaching the Gospel and teaching the Catholic faith you will worthily and wisely fulfill the ministry of God's word? Are you resolved that you will bind yourself ever more closely to Christ, the high priest who for us offered himself to the Father as a spotless victim, and that with Christ you will consecrate yourself to God for the salvation of your brothers and sisters? Do you promise respect and obedience to [the Diocesan Bishop and his successors]? May God who has begun this good work in you bring it to fulfillment. After I renew my promises, Monsignor Kemme may lead me to around the church to the principle locations of the church: the chair, the tabernacle, the baptismal font and the confessional. I, Daren J. Zehnle, on assuming the office of pastor of Sacred Heart Parish, Virden, Illinois, and of Saint Patrick Parish, Girard, Illinois, promise that I shall always preserve communion with the Catholic Church whether in the words I speak or in the way I act. With great care and fidelity I shall carry out the responsibilities by which I am bound in relation both to the universal church and to th particular church in which I am called to exercise my service according to the requirements of the law. May God help in this way and the holy Gospels of God which I touch with my hands. 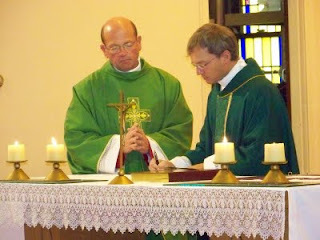 Monsignor Kemme will be present at the 8:15 a.m. Mass in Virden and at the 10:00 a.m. Mass in Girard for this rite. I know some of my new parishioners are readers of this blog; would any you like to take pictures for me? As you can probably tell by the recent lack of posts, this past week has been a busy blur. After soccer practice Friday evening about thirty of the high school students came to the rectory to help load my personal effects onto the trailers and into the trucks that would take me to Virden the next day. It took about three hours to get everything loaded, most likely simply because there were too many of us there to coordinate things well and I hadn't planned on so many (you'd think I might've learned after Monday's turnout...). Typically in such situations you end up, as it were, with too many chiefs and not enough indians; we had too few of either but plenty of jesters. Toward the end it became a bit hectic, but I'm glad so many came to help. Saturday morning I celebrated my last Mass at St. Anthony's as Parochial Vicar. After Mass, one of the parishioners gave me a farewell gift of delicious chocolate chip cookies. That morning the soccer team played against Mater Dei high school at Bulldog Field. The boys played the best game I've seen them play eventhough they lost 1-3. The boys came onto the field wearing wristbands made from atheletic tape with an overlapping D and Z on them in imitation of my initials they found on a wax seal they found when helping to pack my things. I was very touched and knew then they intended to play that game for me. I was humbled and proud. Just before the game, they presented me with a ball bearing each of their signatures and jersey numbers. It was a most fitting gift. After the game we hopped into the vehicles and made our way to Virden after a mostly uneventful drive. Twelve students accompanied me and three others met us in Virden that evening. It took only one hour to unload the trucks and trailers, much to my surprise. I concelebrated Mass with Father Sperl at 5:30 and joined the parishioners afterwards for a potluck dinner to thank Father Sperl for his ministry over twenty-six years and to welcome me. The parishioners welcomed me very warmly and were very hospitable to the students who came to help me move. It was a good and relaxing evening and I look forward to meeting more of the parishioners in the coming days and weeks. The students and I returned to the rectory and continued unpacking for a bit before retiring for the night. I celebrated Mass at 8:15 Sunday morning and then continued unpacking. That day happened to be the parish's annual fried chicken dinner so my helpers and I attended the dinner and enjoyed a delicious meal. I was really impressed with the food and the organization of the event. After more unpacking we left for Effingham so they could finish their homework. The priests of the Diocese gathered in Effingham this week for their annual convocation, which concluded this morning. I am now in the rectory in Virden and have spent a good part of the evening unpacking my library; I still have a way to go. In the morning I have to make an unplanned and quick return to Effingham to pick up some drycleaning I forgot to pick up before I left this afternoon. I'll also pack up some Christmas decorations that I intended to pick up Sunday afternoon. In the afternoon I'll meet with my secretary and see where our conversation leads. Saturday I will be in Springfield teaching a class on the Creed for the lay ministry formation program and Sunday morning the Diocesan Administrator will come to install as pastor of these two parishes. Hopefully next week will be a bit slower than this week. This past Monday afternoon the high school students did an excellent job packing up most of my things and placing them in the garage in preparation for the loading of the trucks that will take place this evening following soccer practice (and maybe a quick bite to eat). I still have a few things to finish packing this morning, but all is well underway. My furniture (a bedroom set, two bookcases, two chairs and a couple of side tables) will be loaded this evening, as well. In the morning I will celebrate my final Mass here as the Parochial Vicar. The soccer team has a match here later in the morning. After the game, we will hop in the trucks and make our way to Virden. Several of the students will be accompanying me to help unload the trucks and unpack the boxes to help me get settled in as quickly as possible; I'm one of those sorts that does not function well with clutter and needs to be at least somewhat settled in. Yesterday and today I feel rather in a daze, with much to do but uncertain what should be done first and when. My mind and emotions are mixed on this last full day here in this parish. With the recent and delightful news that Fr. Leo Patalinghug of Grace Before Meals, whom I had the pleasure of meeting at the World Youth Day 2008 in Sydney and who very kindly links to my blog, defeated the Iron Chief Bobby Flay in a recent episode of the Food Network's Throwdown with Bobby Flay, I can't help but offer a small reflection on food and the presence of God. Wednesday afternoon I was making a batch of the Roman speciality sauce all amatriciana - very simple and wonderfully delicious - for the soccer team's pasta night that evening. I had been in the kitchen for some time preparing the sauce when our housekeeper came into the kitchen and said, "It smells delicious in here!" I was a bit struck by her words because at the time I did not notice the smell; I had simply grown accustomed to it and noticed it no longer. To remedy this I went upstairs for a moments and when I returned to the kitchen the delicious scent could not be missed. She was right. Pancetta, garlic, tomatoes, salt and pepper: what's not to like? Prayer and our recognition of the presence of God in our lives is often like this. Sometimes we grow "used" to God's presence, we grow "used" to the "routine" of prayer and do not notice its effects, until we step outside of God's presence or stop praying. Then, once we enter back in, we realize what we had all the while but did not notice. Let of each of us, then, not stay out of the kitchen, but hop right in. Reuters is carrying an interesting story about a carrier pigeon delivering data faster than the Internet in South Africa. And here I thought carrier pigeons were extinct; I wonder which bird I've confused it with (and it isn't the dodo). I wonder if it's possible to acquire a few carrier pigeons to use here. As the chaos of the past week and a half comes - thankfully - to an end, the chaos of the next few days begins. I am glad to report that I have been able to rest the past couple of days and have happily slept through the last two nights, something I hadn't done in about a week. After celebrating a funeral Mass late this morning, I set to work for an afternoon of packing my belongings in preparation for my move to Virden this Saturday. About fifteen of the high school students came to help. I was a bit surprised by the number of them, and very grateful, especially considering most of them stayed for the four hours I had planned to use for packing. We started off really well and kept basically organized, but there were only about six of them at first. Some of them I put to work in my office and packed it they did. They packed more of it than I intended, but all is well and will save me more work later. The others I set to work in my library and we now have that nearly finished. I still have to pack my electronic equipment (television, stereo, computer, etc.) and clothes, and a few other odds and ends that I'm not quite sure how to pack. I also have a "junk drawer" or two to sort through (don't we all?) and a closet to go through that has things in it I'm not sure I've set eyes on since I arrived here four years ago. All of the packed boxes have been moved to the garage and are ready to be loaded onto the trucks and trailers Friday afternoon. I'm amazed at the generosity of the students. Of all things they could have been doing on a beautiful afternoon free of school, they chose to spend it helping me pack. I'm also amazed at the speed with which they can work, when they put their mind to it. Tomorrow morning I will drive to Springfield to concelebrate the funeral Mass for my Pastor's father. Afterwards I will return to Effingham for a bit of packing and a soccer game. I'm not sure how much blogging will be done during the remainder of the week. If I don't post much, know that it is because I'm packing and saying farewell and not because I'm abandonging the blog. Your prayers, as always, are humbly requested. ...or just what the Dr ordered (a little tribute to Rocky and Bullwinkle). Last night around eighty high school students turned out for the Bring Your Own Dr Pepper party thrown as a farewell bash. I had more fun last night than I've had all week. It was a much needed night. I don't believe I've ever seen quiet as many empty Dr Pepper cans in one place before and I've certainly never played Apples to Apples with so many people all at once. The party began a little after 7:00 p.m. and ended about 10:30 p.m.; many of the students had sporting events early this morning and I couldn't have stayed up any longer if I tried. Those three hours reminded me that even though is much on my plate, as it were, right now, I can only do one thing at a time. Over the course of the week I failed to carve out time simply for fun, though I daresay I've no idea how I could have it in anywhere if I had tried. As in my life, so in my studies, I consider it most fitting for a true man to mingle and mild and cheerful spirit with my more serious mood, so that seriousness should not fall away into melancholy nor jest into mere license. Guided by this principle, I now and then interupt my more serious work with jollity and play. I neglected jollity and play and began to feel quite overwhelmed. It is a lesson I hope I don't soon forget. So, I'm living life right now one Mass at a time. I've celebrated two Masses already today and will celebrate one more in a couple of hours. Tomorrow I will celebrate three Masses and Monday it looks as though I will celebrate two Masses, as well as on Tuesday (though I'm not concerned about Tuesday). If you've done the math, you'll see that over the span of three days (Saturday, Sunday and Monday), I will celebrate eight Masses (one Saturday and one Monday Mass, two funerals, three Sunday Masses and one memorial Mass on Sunday night). Hence, I have two Masses down and six to go. Mr. Leo Joseph Enlow, Sr.
Father of the Reverend Monsignor Leo Enlow, pastor of St. Anthony of Padua Parish, Effingham, Illinois. Visitation will be at Staab Funeral Home, 1109 South 5th Street, Springfield , Illinois, on Monday, September 7, 2009 from 4:00 p.m. - 7:00 p.m. A prayer service will be at 3:30 p.m. The Concelebrated Mass of Christian Burial will be at Blessed Sacrament Church, 1725 South Walnut Street, Springfield, Illinois, on Tuesday, September 8, 2009 at 11:00 a.m. Priests wishing to concelebrate should be present by 10:30 a.m.
Burial will be in Calvary Cemetery, Springfield, Illinois. Funeral luncheon will follow at K of C #364 Hall, 2200 South Meadowbrook Road, Springfield, Illinois . Please remember Mr. Enlow in your prayers and also invite the prayers of your people for him. This morning my day began at 6:40 a.m. with the ringing of the telephone. "Good morning, St. Anthony's," I answered rather groggily, fearing news of yet another funeral. The voice on the other end asked, "Is anyone in the office yet?" "No," I answered, with no small trace of irritation and frustration - and even a bit of anger - in my voice. "It isn't even seven o'clock." "Okay," came the reply, and the caller hung up. Thus I expected nothing less than an absolutely miserable day, and the first few hours of the day did not disappoint this expectation, leaving me to wonder what else could go wrong in one day. But thanks be to God the day improved remarkably once I made my First Friday visits. One of the women I visit is a dear friend and a tremendous woman of faith and prayer. As we said our goodbyes she reached to the table by her chair and handed me a small prayer book. As she did so she told me she wanted me to have it and opened it to a page with two signatures. When I read the signatures I was left quite speechless and unbelievably grateful. Many years back she attended a conference at which Blessed Teresa of Calcutta spoke. She asked the then-living saint to sign her prayerbook and she did. The day can now only get better. I will soon try to finish the first of three funeral homilies and then have the oil changed in my car before soccer practice. After soccer practice some of the players and I will go out for dinner before a long awaited party. When I first announced my transfer, one of the senior soccer players told me he was going to have a BYODP (Bring Your Own Dr Pepper) party for me at his house and we would play Apples to Apples and other such games and have a great time. His parents consented and he is hosting it tonight; many of the high school students plan to attend as a farewell bash. It should be a hoot. This afternoon about 3:10 p.m. my pastor's father fell asleep in Christ surrounded by his children. I was privileged to have returned to the rectory just before he died and was with him and his family at the end. He is a good man, filled with much love and humor, and will be very much missed. We now have five funerals in seven days. This morning I learned of the unexpected death of another of our parishioners, who likely be buried on Monday or Tuesday. She was one of those I visited on First Fridays. Please keep her, and her family, in your prayers. I told the Pastor of her death and mentioned that I thought next week would be as bad as this week. He replied, "It can't be." I hope he's right. I'm not sure who the patron saint is of overly stressed and exhausted clergy, but I suspect Saint John Vianney will certainly be happy to intercede for us. Please ask him to pray for us. Pray that we remain calm and are filled with the strength to see to our duties and to provide pastoral care for our people. Pray that my pastor can be of comfort to his siblings as they grieve for their father, who remains with us this morning. Pray that I will be able to pack my belongings by Friday afternoon. General: That the word of God may be better known, welcomed and lived as the source of freedom and joy. Mission: That Christians in Laos, Cambodia and Myanmar, who often meet with great difficulties, may not be discouraged from announcing the Gospel to their brothers, trusting in the strength of the Holy Spirit. Lord Jesus, present in the Most Blessed Sacrament, and living perpetually among us through Your Priests, grant that the words of Your Priests may be only Your words, that their gestures be only Your gestures, and that their lives be a true reflection of Your life. Grant that they may be men who speak to God on behalf of His people,and speak to His people of God. Grant that they be courageous in service, serving the Church as she asks to be served. Grant that they may be men who witness to eternity in our time, travelling on the paths of history in Your steps,and doing good for all. Grant that they may be faithful to their commitments, zealous in their vocation and mission, clear mirrors of their own identity, and living the joy of the gift they have received. ...and it isn't half finished yet. Sunday afternoon the parish hosted an open house for me to allow the parishioners to wish me well before things became too chaotic (for which I am very grateful now). The above picture was taken before the last 9:15 a.m. Sunday Mass I celebrated in the parish. 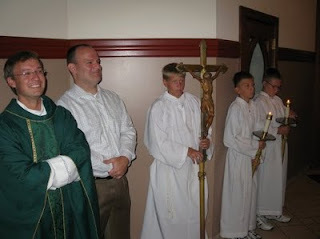 The lector and I must have just exchanged a humorous comment when the picture was taken. It was a very touching afternoon, filled with many tears and much laughter. I will miss this parish immensely. You can see a few pictures from the reception here. With the preaching of my farewell homily at two Masses prior to the farewell reception, the day was very emotional and quite exhausting. The day ended with dinner with two families followed by the beginning of my packing. Three of the high school students came by to help begin packing my library. After an hour and a half of packing, we were almost halfway through my books. Another group of students and I worked a bit more on the books last night and tonight, and are now almost finished with my books; I think we have only the ones in my office left. The books are requiring a lot more boxes than I anticipated. The students have proven both good company and good helpers, and for their generous help I am very grateful. As all of this was happening, the health of my pastor's father continued to decline. Today he was placed in hospice care and is with us in the rectory, together with my pastor's immediate family, who have been with us for several days now. Please keep his father, and all of them, in your prayers. His family is a delight and it is always good to have them here, even in these difficult days. I taught my pastor's classes at the high school Monday and Tuesday and had a funeral yesterday, as well. He has a funeral tomorrow and I have another funeral on Saturday while he has two weddings that day. I wish that there was more I could do to ease his schedule, but I'm not sure what else I can do, since I have my own pressing duties to attend to. You might be able to guess that these past few days have been filled with much chaos, as the exceptional circumstances are tended to at the same time as the usual daily work. Consequently, we are both very tired and, at least for me, a bit stressed. I've slept precious little the past three nights and have had only a few moments of "down time" each day. I'm in need of a holiday, but cannot possibly take one. Please keep me also in your prayers. I leave the parish next week Saturday and hope to be able to find time to pack up my belongings before then... At the rate things are going that seems less and less likely, but it must be done. Pineapple shortbread cookies! Thank you, Sarah!!! Last night we had our first non-tournament soccer match of the season. I'm delighted to say that Vandalia Vandals fell to the St. Anthony Bulldogs on Bulldog Field. Well done, boys! The St. Anthony High School Soccer Team hosted the Vandalia High School Vandals in Varsity and Junior Varsity soccer matches. In the Varsity game the Bulldogs opened scoring when Riley Westenforf passed to Doug Field who then passed it back to Westendorf who placed an outside shot into the corner of the goal. St. Anthony led 1 - 0 until about the 15:00 minute mark when Doug Field placed a "direct, free kick" past the waiting Vandalia goal keeper. The free kick was awarded after a Vandalia player pushed off a St. Anthony player. The foul resulted in a 2 - 0 lead for St. Anthony. Riley Westendorf scored again on a cross from Michael Kabbes when the ball deflected off of a Vandalia player. Vandalia then posted their first goal when a St.. Anthony player accidentally stopped the ball with his hand inside their penalty box. When a team commits a foul or hand-ball inside their own penalty box, a penalty kick is awarded to the opposing team. The ball was placed 12 yards from the goal and it was one vs one, Codey Norris (Vandalia) vs Gary Hanner(St. Anthony). Codey Norris shot a driving shot to Gary Hanner's right side which was too much for the senior goal keeper. St. Anthony later added three more goals from John Kay, Michael Kabbes, and Aaron Wall to end the match St. Anthony 6, Vandalia 1. The Junior Varsity Match was an evenly matched bout between the same schools. St. Anthony was able to squeak out another victory for the JV squad led by sophomore Ryan Willenborg and Junior, Hayden Esker. St. Anthony's next match is this Thursday at 4:30 Varsity and 6:00 Junior Varsity against East Richland. Come out and support the 2009 St. Anthony Soccer Team.